Apple iPhone device gives you facility to view hotmail emails, your contacts and calendar also. 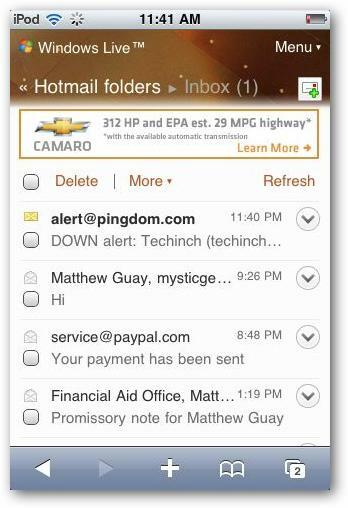 Exchange ActiveSync automatically shows a new email when it comes. Any account changes that you make will be synced automatically with you Windows live hotmail. Wao! This is really cool. Open Mail app to add email account to your device. Write your hotmail email, username, password and brief description to explain your account. Don’t write anything in “Domain” field. Mail will then verify your account. Screen will refresh and you will see a new field namely “Server”. Write “m.hotmail.com” in this field. To sync contacts and calendar, click on “ON” button and then “Save”. If you have more than one calendar, all will be synced to your device. Your Windows Hot mail emails will be shifted automatically to your iPhone after receiving. Enjoy guys!